As a leading provider of end-to-end service supply chain solutions, Flash Global is dedicated to helping established and emerging high-tech OEMs meet ever-increasing consumer demands the world over. 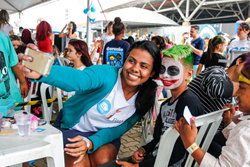 At the same time, Flash is equally committed to giving back to the global communities where they live and work, which is why the company proudly serves as title sponsor of Hamburgada do Bem in Brazil. Hamburgada do Bem is a nonprofit social program that began in November 2015 with a mission to provide a fun-filled day of games, love and hot-off-the grill hamburgers once a month to hundreds of schoolchildren in some of the most impoverished neighborhoods in São Paulo, Brazil—a city that is home to one of Flash Global’s five global service centers. The Hamburgada program quickly expanded beyond São Paulo and recently celebrated its two-year anniversary with a gala event outside Arena do Grêmio, home to one of the largest soccer clubs in Brazil, on October 28 in Porto Alegre. Six members of Flash Global’s Latin America team were among 200 volunteers on hand to help make the day memorable for more than 600 children—for many of whom the hamburgers and fries would be the only hot meal they would get that month. Interacting with the kids and hearing their stories makes supporting Hamburgada a labor of love, Flash team members said. “I am extremely proud of our employees and the outreach made to help those in need. Making a difference in the lives of people…even if for a day, can have a lifetime impact. We continue to find ways to give back to our local communities,” said Sam Mikles, President and CEO of Flash Global. Raphael Lima, a Coordinator of Logistics on Flash Global’s LATAM team, has volunteered at almost all Hamburgada events since the program’s inception. In addition to helping operate the grills at the Porto Alegre event, he also took over Flash Global’s social media accounts to drive real-time interaction with thousands of followers from all around the world. Hamburgada do Bem relies heavily on social media to generate financial support. As title sponsor, Flash Global provides money to support the infrastructure and defray costs at each Hamburgada event, and also shares service supply chain expertise to help coach Hamburgada stakeholders on organizational and process best practices. Headquartered in New Jersey, Flash Global designs and implements end-to-end service supply chain strategies for rapidly expanding companies, including many of the world’s top high-tech OEMs. Through its unique Simplicity of One approach — one comprehensive suite of integrated services, a single point of contact and one contract — Flash creates custom solutions that enable companies to efficiently scale in countries all around the world. Companies leverage in-region and in-country expertise throughout Flash’s worldwide infrastructure of global service centers, distribution centers and forward stocking locations to seamlessly move products across international borders and serve their customer bases. To learn more about Flash Global, visit http://www.flashglobal.com.